This cute home security camera and nanny cam has everything you need to keep your home and family safe and it is at a really good price point. 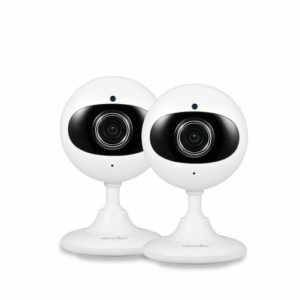 For less than $100, you actually have two of these nanny cams, either in black or white. 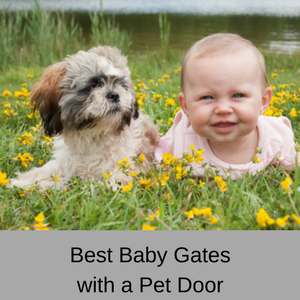 They actually look like EYES staring at you, but they are also great value for money and have very positive online customer reviews. If you want 2-way communication, IR night vision, a wide angle lens with sound & motion detection, then you need to check out this home security camera and nanny cam by Wansview. This home security cam doesn’t have pan & tilt, a digital zoom or an SD card, but for the price point it is great value. 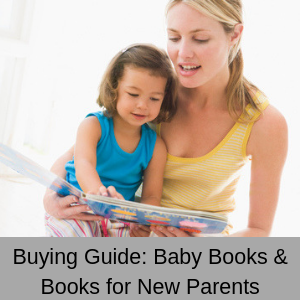 If these features are important to you, Wansview also offer a nanny cam with all of these features, but you can buy two of the model I am reviewing here, for the price of the model with all of these additional features. You can also buy just one of these Wansview nanny cams, instead of two, at an absolutely fabulous and cheap price. 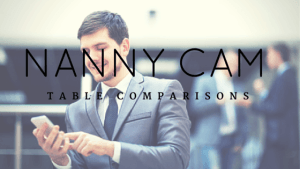 Of course, you can also read my other reviews as well and select another nanny cam from my list. Affordable home security camera and nanny cam. Wide angle lens (120 degrees). Not all home security cameras offer you 2-way communication, but it is a very nice feature that helps you to keep in contact with everyone at home. Of course, you can talk to them on the phone, but you can’t see them at the same time. Being able to look at your children and have a conversation is what you want when you are working away from home. 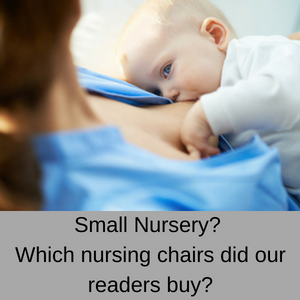 You can also sing a lullaby to your little one in the nursery if you have been alerted that they are awake and unsettled, giving you the feeling that you are still involved with your family, even when you are on the other side of the world. With both sound and motion detection and alert notifications via email, you will be instantly aware of any changes at home. 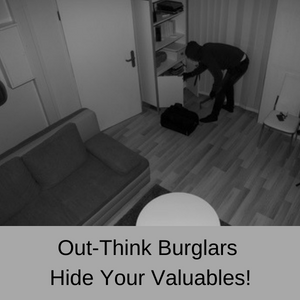 This is ideal if you are going on holiday and leaving your home vacant for a period of time or if you are working night shift, as you can stop worrying about returning to a home that has been burgled. Sound and motion detection is also great because you know when your children have come home from school or when your little on wakes in the nursery. Feeling that you are still taking care of your family when you are working away from home is essential for your peace of mind. Without a pan & tilt feature, you really need a wide angle lens that lets you see as much of the room as possible. This Wansview home security camera and nanny cam offers you a 120 degree field of view, meaning that you won’t miss anything that happens in the room. 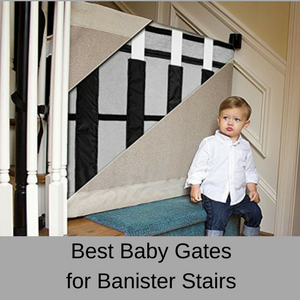 So you will easily catch your toddler scampering across the living room floor or join in with everyone as they eat dinner. 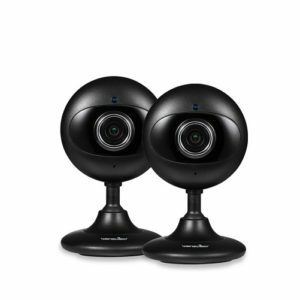 This Wansview home security camera and nanny cam doesn’t have an SD card slot or cloud storage, but you can save your images and videos to your mobile device and to your computer using the iSmartViewPro app. Not saving to the cloud helps to save you a lot of money and it is easy to transfer your images from your mobile phone or tablet to your PC. You can also save the videos directly to your PC and if you do this, each saved video recording can be up to 60 minutes long (your mobile storage won’t be as big as this!). The Wansview nanny cam gives you crystal clear vision during both the day and night. With four LEDs and night vision up to 20 feet, you will clearly catch anything that happens at night in your home. 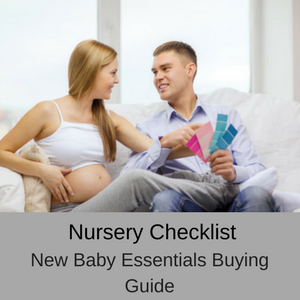 Night time vision is perfect for when you are working away from home in another time zone or on night shift and you want to check if your little one is sound asleep in the nursery. You can also check on your pets or an elderly relative during the night making sure that everyone one is safe and sound. This nanny cam can only be used on the 2.4 Ghz band and not the 5 Ghz band. Having said that, all you need to do is to download the app onto your mobile phone, power up the nanny cam, and then follow the prompts on the app. Don’t forget to change your password to make it totally secure. 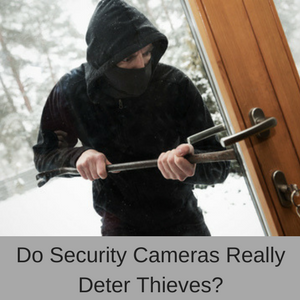 The overwhelming majority of customers find that the setup and configuration of this home security camera and nanny cam is pretty basic and simple. A few have had problems, but they are definitely in the minority. The Wansview app makes configuration as easy as reading a barcode on the rear of the camera, then entering the WiFi details for your home. This camera (2-pack) is fun! Being able to see what is going on, listen and even send audio from my phone is great. LOVE IT! This has been great and so easy to install. The customer service is amazing and super responsive. A great price for a good, basic camera. I use it as a back-up to my pan-and-tilt camera because it is very reliable. If you want a basic, easy to set up and use home security camera and nanny cam that is also very well priced (less than $100), then this Wansview model ticks all the boxes. 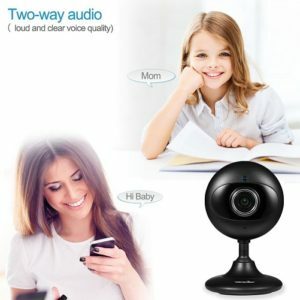 It doesn’t have all the features you might want, but if price is an issue and you still want a nanny cam that has good reviews, then you should definitely check this model out. 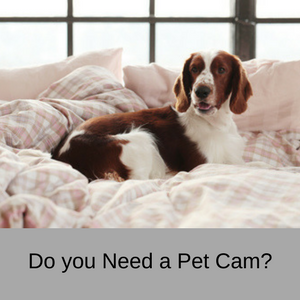 With 2-way communication, night time vision, sound and motion alerts, a wide angle lens and crystal clear images, you can’t go far wrong with this nanny cam. Compare over 30 nanny cams and home security cameras here.